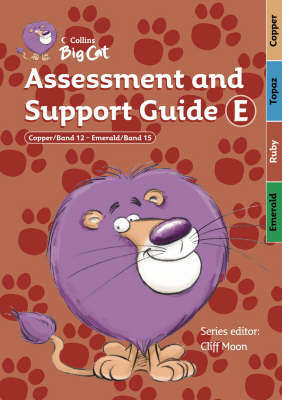 Collins Big Cat Assessment and Support Guide E provides teachers with practical planning and teaching support. It helps teachers assess and identify the needs of each child or group, and to teach essential literacy skills in the context of guided reading. * A practical planning tool containing book-by-book information for Copper/ Band 12 to Emerald/ Band 15, including: text type, curriculum links, learning objectives, interest words and related resources to help you identify the right books for your guided reading groups. * Photocopiable activity sheets for every book to help practice and extend the literacy objectives covered in the guided reading session, and support writing. * Assessment support using a range of assessment techniques to help you identify the needs of individual groups, with photocopiable masters. * Support for managing guided reading in the classroom, providing further information on the key features of guided reading and its use within a balanced literacy programme.